has been named for a member who showed a great compassion for the club and its members and in doing so improved greatly with her riding and developed a wonderful bond with her horse Mary. Margaret sadly passed away in 2013 and will be greatly missed by all that knew her. Margaret’s husband Graham has announced that he will be donating $100 for the winner of this award in honour of Margaret. This year we had a new perpetual award. The award is in memory of a Gidge Adult Riding club stalwart – Paddy Me Lad – who very unexpectedly passed during the year. Paddy (and his human Alison) have been members of the club for the past 12 years. Paddy was such a character and was well known to many members and instructors, both past and present. The Paddy Me Lad Memorial Award recognises a standout character moment for a horse/rider combination during the year - whether it be a quirky/funny moment, or an achievement. Some history: Paddy Me Lad was one of the foals in the 1990 crop. He began his racing career as a 2 year-old and went on to be very successful over the next 8 years. He raced all over the state but his favourite track was Kalgoorlie. From 120 starts he had 21 wins and won in excess of $300,000, which in today’s terms would equate to about $1million. Paddy was fortunate enough to adopt Alison in 2000 and late that year they both joined Gidge Adult Riding Club. Alison remembers her first rally well – she had to ride Paddy home at the end of the day during a thunderstorm – thunder, lightning and rain with Paddy as a newly retired race horse just plodding along calmly and not fazed at all. At the first Black Tie they entered Paddy took out 1st place in the Pleasure Hack. He did however have his moments  Alison entered the hacking at the Gidge show one year and won reserve rider – she thinks it has something to do with the fact that Paddy nearly took out the arena and had to be led out by the Judge! Paddy was also able to flummox many a GARC instructor who tried all of their tricks to encourage him to take up the right rein canter lead. Sometimes he would but sometimes he just didn’t feel like it! The Western Australia Horse Council WAHC extends their sympathy to those people who have been affected by the fires throughout the state. The WAHC on behalf of those affected by the fires, would like to express their grateful thanks for the offers of help and support that have been received from businesses, clubs and individuals. If you are able to offer assistance, please contact the WAHC Chairperson Diane Bennit on [email protected]. I require your or the business name, address and contact number. Only the contact details will be published. The list will be available on the Western Australian Horse Council website http://wahorsecouncil.com.au/information.html and Facebook page https://www.facebook.com/WA-Horse-Council-194894953913813/?fref=ts. This list of assistance will be updated as further offers of support are received. Well I’m writing my last Presidents report for 2016 and beyond. What a year it’s been with great numbers attending our rallies and many of our clinics throughout the year. Fantastic entries for both of our Show Jumping Training days and our Dressage Training day has seen much needed funds poured back into the club account. Our instructors have worked hard in making us and our horses achieve things we didn’t think were possible and I would like to personally thank them for all their contributions throughout the year. The completion of works to the arena, the build of the round yard, purchasing of new equipment has really marked our club as the best around. Our facilities are wonderful, our members are even better. I am hoping to see everyone back again in 2017! Our AGM is being held at the grounds on the 17th January to vote in the new committee for 2017. I hope all of you can attend. The nomination forms will be sent out shortly. I would like to personally thank my extremely hard working committee. Without them this club would not be what it is today. From lesson planning, groups, running the canteen, overseeing rally and event days, organising entry forms and bookings, Instructor bookings, accounts and payments the list goes on and on! Our Dressage Training Day was a huge success A massive thank you to the members that showed to set up on the Saturday in gale force winds, rain and hail only to see the arenas blow away. Another big thanks to those members ( the same ones) that turned up early on the Sunday to reset everything so the day could run without a hitch. Without your help these days cannot run. The day ran bang on time and the feedback from riders that entered was fantastic with lots of great input from the judges. First class starts at 8:30am-9:00am depending on numbers. A maximum of 3 classes at a 2 consecutive heights can be entered per horse and rider combination. First class starts at 8:30am-9:00am depending on numbers. A maximum of 3 classes at a 2 consecutive heights can be entered per horse and rider combination. If you are NOT a member of Gidgegannup Equestrian Association (GEA) or EWA (Competitor / Participant) you will need to complete the GEA Competition Membership form and pay the fee of $10 and include this with your entry payment. NOTE: Competition membership is only available to riders 18 years or over (as per the GEA constitution). Riders under 18 years must be a member of EWA to compete. All riders (excluding GEA members) MUST include a signed waiver with their entry. Stables will be available. Please clean your stable after use or they will not be made available for free in the future. Please pick up your horse’s manure from stables and in the car park and drop at manure pit near stables or bring a bag and take it home ☺. Stallions experienced at coping in group environments are welcome however you MUST apply to the organisers prior to submitting your entry and EA stallion guidelines must be adhered to. Draw available: http://www.cavalletti.com.au/ on Thursday 1st October. GEA are holding a Show Jumping Training Day on the 5th July. David Carey will be there to offer support and advice. Canteen open all day. These are fantastic fun days and a great opportunity to jump a full round without the pressure of competition. Draw available: http://www.cavalletti.com.au/ on Thursday 2nd July. We were lucky to secure Stephen Johnson for a Cross Country Clinic on the Grounds at Gidgegannup Sat 2nd May. This is rare opportunity as we only have Stephen available for a couple of special rally dates this year. All Levels of Jumpers welcome (introductory included). Classes will go for 1.5 hrs - numbers are limited so get your entry in ASAP. *Please also complete and submit with form/payment the attached Dissclaimer if you would like to participate in the Cross Country Clinic. We are also offering Flat work classes in the morning with our lovely Katrin Kuenstler. Please submit form with payment details to the club account before Friday 24th April. If you have any "special requests" due to extenuating circumstances please indicate these on your booking form and we will make every effort to accommodate you but cannot make any guarantees. We will allocate stables and a rostered job which will be emailed out with your lesson times. (Canteen will available for snacks and drinks only). If you have any questions or trouble downloading the attached form please send us an email [email protected] or contact Tracy 0412778343 or Cheryl 0402410961 or Sonya 0413242981. Our member Pam Jackson's life changed dramatically on January 15 2013. Her 15 year old son John was struck down by a car whilst riding his push bike. The link below tells John's Story and his incredible will to survive against the odds. A maximum of 2 tests per horse, these may be at the same level or two consecutive levels. Welcome to the first Showjumping training day for 2015 hosted by Gidgegannup Equestrian Association. NCAS qualified instructor Dave Carey will be on course to help out. Heights 45, 65, 80, 90, 100cm. Maximum 3 rounds per horse at two consecutive heights. Great atmosphere & canteen available on the day. There are no helper fees at this event – so please lend a hand when you can! Welcome all! Members - please come along and enjoy a day of demonstrations, health treatments for your horse, saddle fitting, willy washing, bling magic and show preparation !!! “BLING MAGIC” with Melody Semler from Magic Browbands – Bring along your favourite gloves, helmet, spurs, jods, anything…and Melody can add some Swarovski crystals to your things to bling them up a little. Lots of colours plus clear and sparkly available. Costs range from $10-$50 depending on how many crystals you want. Please send a return email letting us know if you would like to book for the Saddle Fitting, Willy Wash and/or a Bowen Treatment. Payment on the day to the individual demonstrators . We look forward to what's going to be a great start for the year ahead! The harvest and movement vehicle ban information is placed on the Fire Information Line 0n 9290 6644, it is also highlighted in Red on our main web page at www.mundaring.wa.gov.au and links to information are provided underneath the Fire Danger Rating Indicator. In addition it is broadcast via the ABC 720 at 10.15am and there is an sms service that the shire utilises for specific groups such as the Forest products Commission, Western Power etc who undertake commercial activities in the shire to which a HMV Ban significantly impacts. Total Fire Bans affect everyone, whether you live near bush or in a built up area. They are a prevention measure to warn you of a day of predicted adverse fire weather. On these days you should be particularly careful not to cause a fire to start. carry out an activity in the open air that causes or is likely to cause a fire. use of incinerators and other activities (as described in the ‘What Can’t I do on a Total Fire Ban day?’ section). WHEN WILL A TOTAL FIRE BAN BE DECLARED? 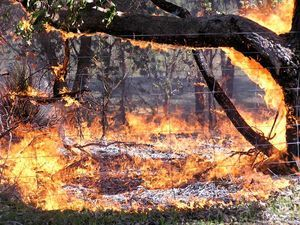 They are declared on days when fires will be difficult to control, are most likely to threaten lives and property, or when widespread fires are impacting the availability of resources. The decision to put a ban in place is based on the weather forecast. FESA consults with the Bureau of Meteorology to determine when dangerous fire weather conditions are likely. FESA also consults with local govenments that will be affected. The need for the ban to remain is assessed and may be revoked in the morning if weather conditions ease. The status of a ban should be checked after 6pm each day. HOW LONG IS A TOTAL FIRE BAN IN PLACE FOR? The ban will be in place from 12.01am to 11.59pm on the day declared. HOW IS A TOTAL FIRE BAN DECLARED? They are declared by the Minister for Emergency Services, or his authorised delegate, using the whole local government boundary. HOW WILL I KNOW WHEN ONE HAS BEEN DECLARED?